Art Advantage Oil and Acrylic Brush Set, 24-Piece. Synthetic and natural bristle brushes. Perfect for oil and acrylic paint. 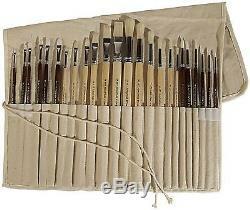 Art Advantage twenty-four piece brush set. Long handle brushes are perfect for both oil and acrylic to use with a free canvas brush roll-up. Twelve white nylon brushes and twelve sturdy hog bristle brushes. Each set has one of each flat and round in sizes #2, #4, #6, #8, #10, #12 in both synthetic and natural bristle. H x L x W: 15.0" x 3.38" x 3.38 Item weight: 1.5 pounds. We are not responsible for any incorrect or undeliverable addresses. We have order fulfillment centers throughout the US. Have a question about an item or order? The item "Art Advantage Oil and Acrylic Brush Set, 24-Piece, Free Shipping, New" is in sale since Friday, September 06, 2013. This item is in the category "Crafts\Art Supplies\Painting\Brushes, Palettes & Knives". The seller is "xa-electronics" and is located in Multiple Locations, USA. This item can be shipped to United States.